The Fellowship was fortunate enough to obtain a copy of DRAGON AGE: MAGEKILLER #1 from Dark Horse Comics. Greg Rucka writes, Carmen Carnero pencils, Terry Pallot inks, Michael Atiyeh colors, and Michael Heisler letters. Tessa and Marius practice a trade that is not looked on well – they kill mages. It’s also not easy, but they’re quite good at it. Marius has taught Tessa all she knows about the trade, and she acts as negotiator for their fee. One day Tessa is followed back to their lodging by the servant of a mage bearing a request. They accept after initial reservations, and consequently walk into an uncomfortable situation. Given the darkness of the world in the Dragon Age games, I’ve always been a bit surprised by its popularity. That darkness is already represented in this story, using assassins as the main characters, but it’s handled carefully, giving us the sense that there’s at least a dim light in the darkness. And the art is expressive and helps carry the story very effectively. This is a story with some very dark but very cool elements, and it’s honestly hard to go wrong with a Greg Rucka story. You don’t have to be a DA fan to get into this, so hop on board now. 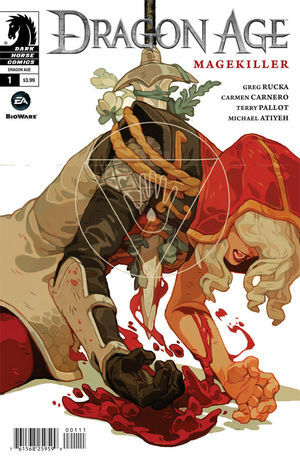 DRAGON AGE: MAGEKILLER #1 is available now at your FLCS or at darkhorse.com.